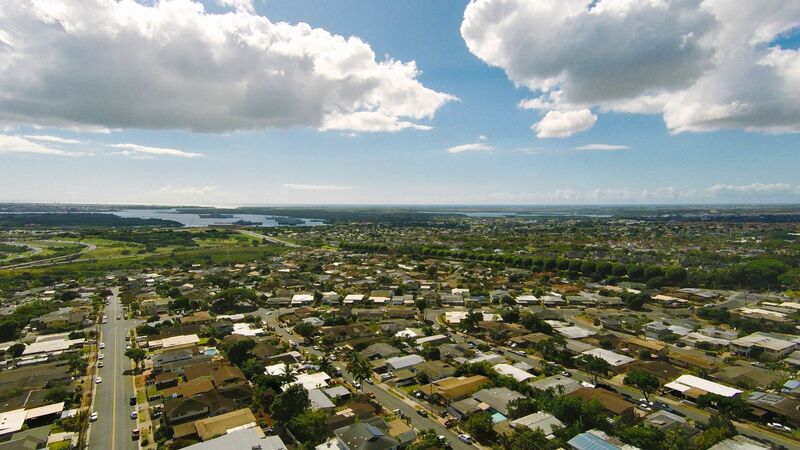 Waipahu is located along the northern shore of both Middle Loch and West Loch of Pearl Harbor. Both Interstate H-1 and Farrington Highway (Hawaii Route 90) run east-west through the length of Waipahu. The neighboring areas of Waipio, Village Park, Royal Kunia and Waikele use Waipahu as their postal city, and are often considered to be part of Waipahu. Waikele is located across the H1 freeway north of Waipahu. Waikele consists of newer subdivisions and an upscale outlet shopping center and world famous golf course. To the west via either roadway can be reached Makakilo and Kapolei, with the Leeward coast beyond. To the east lie Pearl City and the H-2 interchange to Waipiʻo. At the western end of Waipahu is Kunia Road (State Rte. 750) which leads to the Waipahu newer growth areas of Royal Kunia and Village Park north of H-1, and eventually on up across the central plain to Kunia and Schofield Barracks, Wheeler Army Airfield, and Wahiawā. Kunia Road becomes Fort Weaver Road (State Rte. 76) south of Farrington Highway, and goes south through Honouliuli and ʻEwa Villages to ʻEwa Beach. According to the United States Census Bureau, the CDP has a total area of 2.8 square miles (7.2 km2), all of it land. As of the census of 2000, there were 33,108 people, 7,566 households, and 6,431 families residing in the CDP. The population density was 12,882.8 people per square mile (4,974.0/km²). There were 8,033 housing units at an average density of 3,125.7 per square mile (1,206.8/km²). The racial makeup of the CDP was 4.73% White, 0.93% African American, 0.14% Native American, 67.1% Asian, 12.31% Pacific Islander, 0.86% from other races, and 15.26% from two or more races. Hispanic or Latino of any race were 6.09% of the population. There were 7,566 households out of which 36.2% had children under the age of 18 living with them, 59.8% were married couples living together, 18.1% had a female householder with no husband present, and 15.0% were non-families. 11.1% of all households were made up of individuals and 6.0% had someone living alone who was 65 years of age or older. The average household size was 4.23 and the average family size was 4.37. In the CDP the population was spread out with 26.4% under the age of 18, 9.5% from 18 to 24, 26.8% from 25 to 44, 21.5% from 45 to 64, and 15.8% who were 65 years of age or older. The median age was 36 years. For every 100 females there were 97.6 males. For every 100 females age 18 and over, there were 95.3 males. The median income for a household in the CDP was $49,444, and the median income for a family was $51,855. Males had a median income of $28,295 versus $23,818 for females. The per capita income for the CDP was $14,484. About 10.6% of families and 13.8% of the population were below the poverty line, including 17.0% of those under age 18 and 13.9% of those age 65 or over. The total number of Civilian Veterans in Waipahu is 2,376, or 9.8 percent of the total population (National average is 12.70%). In 2000, there were 8,230 people in Waipahu listed as disabled. At the time of the last survey, 14,458 people in Waipahu had a high school diploma, approximately 68.6% of the population (compared to the national average of 80.40%). 2,349 people in Waipahu also had a bachelor's degree or higher, which equates to approximately 11.1% of the total population (National average was 24.40%). Get to know Waipahu better with our featured images and videos.